donated, originally uploaded by dakegra. 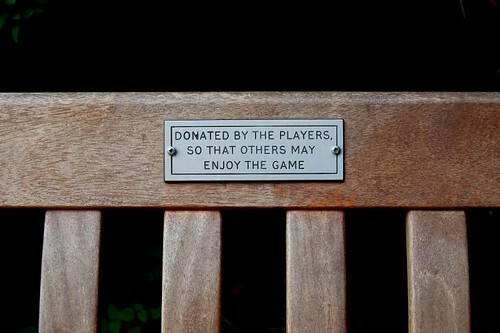 I just love this small plaque on a wooden bench - the idea that the 'players' have got together and sorted out seating for the viewers. The bench is in a large dome, in the centre of which are maybe a dozen thick wooden planks which, when you step on them, cause melodic tones to come out of hidden speakers. This appeals to me in so many ways - today we watched an old guy and his wife try and work out the 'rules' of how it worked - maybe if you stepped lightly, you got higher tones, and stamping produced lower? Comment by Goes well with chocolate & peanut butter. That sounds wicked cool! My son would totally dig something like that. I think I've only been once when it wasn't working, and we've been going there since we had EB, so about 8 years now! S and I have spent hours in there, trying to game the system and watching other people ditto. Playground is one of my favourite pieces of interactive art, ever, and it was made long before interactive art was the buzzword/hateword that it is today. Have you been to see the new Randall-Page stuff? The big carved lumps of rock? Not yet. Not been since May, I think. I'm selling them a little short by calling them big carved lumps of rock. They're fabulous, and well worth a look.